Here is Phone Scoop's full-length, in-depth report on the new Motorola Droid. It easily bests most other Android phones out there, but still has a few major drawbacks. If you're a Verizon Wireless customer who's longed to be on the cutting edge, the Droid is probably your best bet. It is Verizon's first Android phone, and makes a bold entrance with Android 2.0 system software, a 5 megapixel camera and other features that the current crop of Android phones just don't offer. On top of that, it's well built, has an incredible display, and ain't bad looking, either. 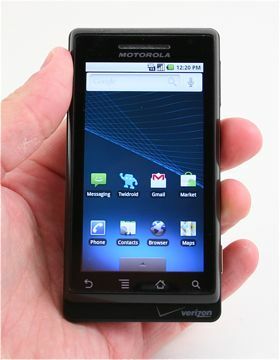 Phone Scoop goes hands-on with the new Motorola Droid, the first Android device for Verizon Wireless. Does it live up to the hype that Verizon has been scaring up the last few weeks? assuming with a 2yr contract. Does it have a sensor on it for calls? I am wanting to know if it has a sensor built-into it whereby when making calls and you place the phone up to your ear/face, the display/touchscreen will then disable so that buttons/widgets/etc aren't accidently pressed when the phone is put up to your face. My LG Touch has this, but the Storm1 didn't. having just spent a year struggling with the blackberry storm, i went to the iphone and ATT a couple weeks back. I was at verizon today to upgrade my wifes phone and was given demonstrations of the motorola droid by no less than 3 sales people (once they saw my iphone they couldn't help themselves i guess). - screen transitions were choppy not smooth and fluid like the iphone. - overall design is clunky and kind of like a brick. i like the htc droid phone much better. - lack of control of the software and hardware platform was evident given the lack of ergonomic factors. If you like the Iphone so much stick with it. This is not the Iphone so stop comparing it to it. I need an app that will allow me to listen to music/podcast via bluetooth. Any suggestions? Motorola makes a laggy phone? No way. Not suprising that moto can't manage to make a smooth running device... I always assumed it was the verizon OS.. but must be a moto processor issue... It's a shame, I'll wait for the HTC version. Funny PS found it laggy because all other reviewers said it's been anything but. Maybe a faulty unit? I noticed a few discrepencies in review. I believe you have a version with the non final software. Since I do remember when training on phone the original software was laggy for the camera but playing with the devices that will be selling Friday the Camera and Video work Great, Also in the Marketplace their is a Tab for Verizon software so far their is VZW Tones, My Verizon, Visual Voicemail, etc etc. I know this phone is going to be a hit and can't wait to get my own. I cant find any negatives yet on the final release except that it is not launching with tethering capabilty but will have that later implemented. I made mention of the Verizon tab in the Android Market. Yes, VZW Tones was the only app in there. Verizon Wireless and Motorola told us we have the final software build of the device. How well does it handle MMS..such as animated .GIF files that have sound playing in the background? Does it show the animation with the sound playing at the same time in the background or does it play the animation on one screen and the sound on another screen like the iPhone? The keyboard issue is kinda a bummer, but honestly I'll most likely use the touch screen keypad more if it's that bad. For software lag, I'm confident that most of these issues will be resolved through firmware updates. The main reason I want this phone though is for the interest it generates. We have a lot of customers looking for a multi-media focused cellphone, and while the Tour/Storm can do facebook, I think we all can agree Blackberry is still more business than party. First thing I'll do when I get this phone is load a movie on it. My smartphone sales will be great. Are Android app developers that buttoned up and space conscious? Can I expect a game like TigerWoods to ever be available on this platform? Is is even logical to compare it to my ipod touch that can utilize the entire 16 gigs for apps/music/video or whatever? Six months down the road I don't want to be hassled with which app do I keep and which can I get rid of to make room. remember most apps are TINY. blackberries only have 32mb for apps. That being said, they are working for a way that only executable files have to be on the phone, an the data (the graphics, saved games, etc) will be able to be on the memory card. "Before running out to the store on November 6 when it goes on sale, I'd wait just a week or two to see what else Verizon Wireless has up its sleeves." Agreed. Reportedly Verizon is throwing everything except the kitchen sink.